Joan Johnsen – or, as we all know her, “Miss Joan” – is trading her longtime role as Children’s Librarian at our Newport Branch for a full-time role as grandmother when she retires this month. Miss Joan as Willy Wonka. In her 14 years with the Library, Miss Joan has helped a generation learn the joy of reading from story times and special events, such as Summer Reading Kickoff and Early Literacy Fair. 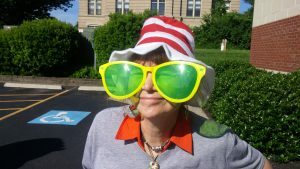 We will have one more opportunity to say thanks on a grand stage when Miss Joan joins our other children’s librarians at 11 a.m. on Wednesday, August 10 at Tower Park in Fort Thomas for the World’s Largest Storytime. We will be reading “Chicka, Chika, Boom, Boom” at noon in a fun, festive event that’s part of the Childhood Literacy Initiative. Miss Joan is a cool cat. The difference Miss Joan has made is evident by the love and joy her children and their parents feel for her. “Years ago, my mother-in-law was a teacher at Dayton and Joan had come to her school to promote the library. She started taking another grandchild there and told me how good Joan was. I started taking my oldest daughter, who is now 12, there and was so impressed by Joan. Her love of books and her energy kept the kids’ attention and mine too. She made that 45 minutes so entertaining for the kids. I have no doubt she loved what she did and it showed everytime. She always had a smile on her face. 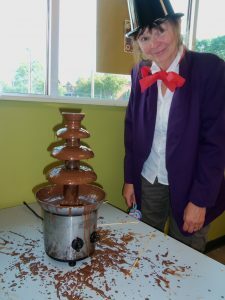 The Library is very lucky to have had her as well as the community,” parent and patron Karen Sower told CCPL. Best of luck in retirement, Miss Joan, and don’t be a stranger!